The business community here has welcomed the signing of the Trans- Pacific Partnership (TPP) and wants it ratified as soon as possible. Until then, its full benefits will not be unlocked, they noted. The TPP, viewed as the most important trade deal negotiated in decades, was signed yesterday in New Zealand by ministers from its member nations. The deal is a far-reaching agreement involving 12 countries, which make up 40 per cent of the world economy. The nations - Australia, Brunei, Canada, Chile, Japan, Malaysia, Mexico, New Zealand, Peru, Singapore, the United States and Vietnam - now have two years to ratify or reject the pact. "Today is a significant achievement, but we have not reached the finish line," said Ms Judith Fergin, the executive director of the American Chamber of Commerce in Singapore. "To unlock the full potential of the agreement, governments and businesses must continue to work together to ensure prompt approval and implementation of the TPP," she added. The chamber's chairman, Mr James Andrade, said the agreement will deliver far-reaching benefits for American businesses already in the region, and signal to other firms that "now is the time to explore opportunities around the Pacific". Mr Ho Meng Kit, chief executive of the Singapore Business Federation, said this latest development is good news for the Singapore business community, especially given the poor global economic outlook and lacklustre trade growth. "The TPP is a high-quality agreement that will hopefully provide a boost of confidence in the current environment as it will present more opportunities for companies seeking to do business in the Asia-Pacific and catalyse new growth," he said. "The agreement will also serve as a pathway towards a free trade agreement of the Asia-Pacific." Still, the TPP has a long way to go before it is ratified, said CIMB Private Bank economist Song Seng Wun. "Now comes the hard part," he added. Even after the deal is ratified and implemented, the benefits to Singapore "might not be fairly obvious", since the Republic is already a very open economy, said Mr Song. 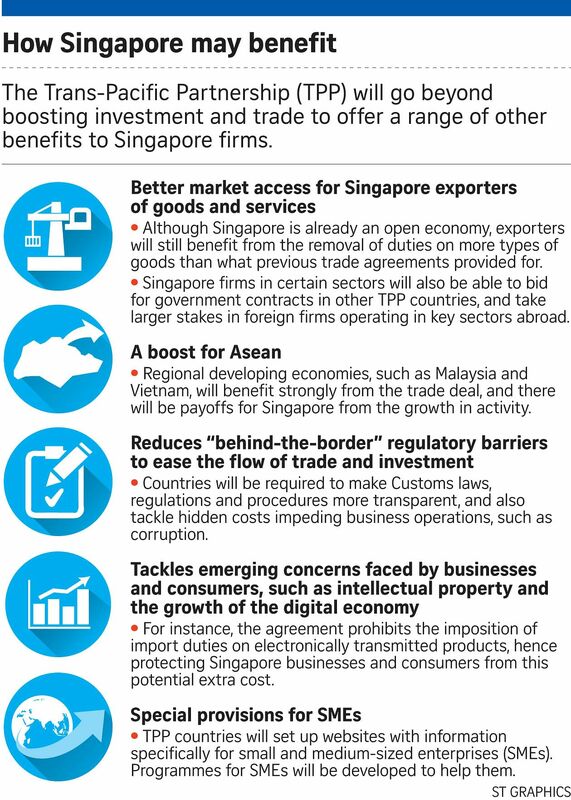 Singapore already has existing free trade agreements with all the countries involved except Canada and Mexico. But the deal should still help to lift trade and enhance countries' growth potential, he added. "There will be many obstacles along the way, but (these trade deals) will strengthen growth in the region in the long term."